Exponential growth is a phenomenon that occurs when the growth rate of the value of a mathematical function is proportional to the function's current value, resulting in its growth with time being an exponential function. Exponential decay occurs in the same way when the growth rate is negative. In the case of a discrete domain of definition with equal intervals, it is also called geometric growth or geometric decay, the function values forming a geometric progression. In either exponential growth or exponential decay, the ratio of the rate of change of the quantity to its current size remains constant over time. Since the time variable, which is the input to this function, occurs as the exponent, this is an exponential function. The number of microorganisms in a culture will increase exponentially until an essential nutrient is exhausted. Typically the first organism splits into two daughter organisms, who then each split to form four, who split to form eight, and so on. Because exponential growth indicates constant growth rate, it is frequently assumed that exponentially growing cells are at a steady-state. However, cells can grow exponentially at a constant rate while remodelling their metabolism and gene expression. A virus (for example SARS, or smallpox) typically will spread exponentially at first, if no artificial immunization is available. Each infected person can infect multiple new people. Human population, if the number of births and deaths per person per year were to remain at current levels (but also see logistic growth). For example, according to the United States Census Bureau, over the last 100 years (1910 to 2010), the population of the United States of America is exponentially increasing at an average rate of one and a half percent a year (1.5%). This means that the doubling time of the American population (depending on the yearly growth in population) is approximately 50 years. Nuclear chain reaction (the concept behind nuclear reactors and nuclear weapons). Each uranium nucleus that undergoes fission produces multiple neutrons, each of which can be absorbed by adjacent uranium atoms, causing them to fission in turn. If the probability of neutron absorption exceeds the probability of neutron escape (a function of the shape and mass of the uranium), k > 0 and so the production rate of neutrons and induced uranium fissions increases exponentially, in an uncontrolled reaction. "Due to the exponential rate of increase, at any point in the chain reaction 99% of the energy will have been released in the last 4.6 generations. It is a reasonable approximation to think of the first 53 generations as a latency period leading up to the actual explosion, which only takes 3–4 generations." Positive feedback within the linear range of electrical or electroacoustic amplification can result in the exponential growth of the amplified signal, although resonance effects may favor some component frequencies of the signal over others. Economic growth is expressed in percentage terms, implying exponential growth. For example, U.S. GDP per capita has grown at an exponential rate of approximately two percent since World War 2. Compound interest at a constant interest rate provides exponential growth of the capital. See also rule of 72. Pyramid schemes or Ponzi schemes also show this type of growth resulting in high profits for a few initial investors and losses among great numbers of investors. In computational complexity theory, computer algorithms of exponential complexity require an exponentially increasing amount of resources (e.g. time, computer memory) for only a constant increase in problem size. So for an algorithm of time complexity 2x, if a problem of size x = 10 requires 10 seconds to complete, and a problem of size x = 11 requires 20 seconds, then a problem of size x = 12 will require 40 seconds. This kind of algorithm typically becomes unusable at very small problem sizes, often between 30 and 100 items (most computer algorithms need to be able to solve much larger problems, up to tens of thousands or even millions of items in reasonable times, something that would be physically impossible with an exponential algorithm). Also, the effects of Moore's Law do not help the situation much because doubling processor speed merely allows you to increase the problem size by a constant. E.g. if a slow processor can solve problems of size x in time t, then a processor twice as fast could only solve problems of size x+constant in the same time t. So exponentially complex algorithms are most often impractical, and the search for more efficient algorithms is one of the central goals of computer science today. If τ > 0 and b > 1, then x has exponential growth. If τ < 0 and b > 1, or τ > 0 and 0 < b < 1, then x has exponential decay. Example: If a species of bacteria doubles every ten minutes, starting out with only one bacterium, how many bacteria would be present after one hour? The question implies a = 1, b = 2 and τ = 10 min. After one hour, or six ten-minute intervals, there would be sixty-four bacteria. Many pairs (b, τ) of a dimensionless non-negative number b and an amount of time τ (a physical quantity which can be expressed as the product of a number of units and a unit of time) represent the same growth rate, with τ proportional to log b. For any fixed b not equal to 1 (e.g. e or 2), the growth rate is given by the non-zero time τ. For any non-zero time τ the growth rate is given by the dimensionless positive number b.
where x0 expresses the initial quantity x(0). The growth constant k is the frequency (number of times per unit time) of growing by a factor e; in finance it is also called the logarithmic return, continuously compounded return, or force of interest. The e-folding time τ is the time it takes to grow by a factor e.
The doubling time T is the time it takes to double. The percent increase r (a dimensionless number) in a period p.
where k = 0 corresponds to r = 0 and to τ and T being infinite. If p is the unit of time the quotient t/p is simply the number of units of time. Using the notation t for the (dimensionless) number of units of time rather than the time itself, t/p can be replaced by t, but for uniformity this has been avoided here. In this case the division by p in the last formula is not a numerical division either, but converts a dimensionless number to the correct quantity including unit. A popular approximated method for calculating the doubling time from the growth rate is the rule of 70, i.e. . This allows an exponentially growing variable to be modeled with a log-linear model. For example, if one wishes to empirically estimate the growth rate from intertemporal data on x, one can linearly regress log x on t.
For a nonlinear variation of this growth model see logistic function. showing that x experiences exponential growth. There is a whole hierarchy of conceivable growth rates that are slower than exponential and faster than linear (in the long run). 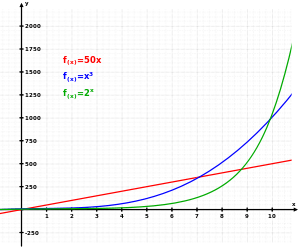 See Degree of a polynomial#The degree computed from the function values. Growth rates may also be faster than exponential. In the most extreme case, when growth increases without bound in finite time, it is called hyperbolic growth. Inbetween exponential and and hyperbolic growth lie more classes of growth behavior, like the hyperoperations beginning at tetration, and , the diagonal of the Ackermann function. Exponential growth models of physical phenomena only apply within limited regions, as unbounded growth is not physically realistic. Although growth may initially be exponential, the modelled phenomena will eventually enter a region in which previously ignored negative feedback factors become significant (leading to a logistic growth model) or other underlying assumptions of the exponential growth model, such as continuity or instantaneous feedback, break down. The second half of the chessboard is the time when an exponentially growing influence is having a significant economic impact on an organization's overall business strategy. ↑ Slavov, Nikolai; Budnik, Bogdan A.; Schwab, David; Airoldi, Edoardo M.; van Oudenaarden, Alexander (2014). "Constant Growth Rate Can Be Supported by Decreasing Energy Flux and Increasing Aerobic Glycolysis". Cell Reports. 7 (3): 705–714. doi:10.1016/j.celrep.2014.03.057. ISSN 2211-1247. ↑ Sublette, Carey. "Introduction to Nuclear Weapon Physics and Design". Nuclear Weapons Archive. Retrieved 2009-05-26. 1 2 Porritt, Jonathan (2005). Capitalism: as if the world matters. London: Earthscan. p. 49. ISBN 1-84407-192-8. Exponent calculator — This calculator enables you to enter an exponent and a base number and see the result. Exponential Growth Calculator — This calculator enables you to perform a variety of calculations relating to exponential consumption growth.